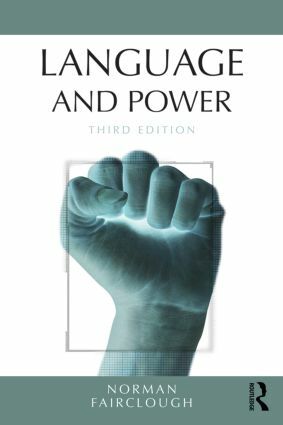 Language and Power is widely recognised both as a classic and an essential introductory textbook to the field of Critical Discourse Analysis. It focusses on how language functions in maintaining and changing power relations in modern society, the ways of analysing language which can reveal these processes and how people can become more conscious of them, as well as, more able to resist and change them. In this twenty-fifth anniversary edition, Norman Fairclough includes a substantial new introduction and brings the discussion up-to-date. He shows both the importance of the book in the development of critical discourse analysis over the past three decades and how language and power relations have changed due to major socio-economic changes. It remains vital reading for all students of discourse analysis, critical discourse analysis and other related courses. Preface. 1. Introduction: Critical Language Study 2. Discourse as social practice. 3. Discourse and power. 4. Discourse, common sense and ideology. 5. Critical discourse analysis in practice: description. 6. Critical discourse analysis in practice: interpretation, explanation, and the position of the analyst. 7. Creativity and struggle in discourse: the discourse of Thatcherism. 8. Discourse in social change. 9. Critical language study and social emancipation: language education in the schools. 10. Language and globalization.